Note:There are lunar eclipse on 18-8-2016, Solar eclipse on 1-9-2016 and Lunar eclipse on 16-9-2016 which would not be visible in India . If you are in a country where it is visible communicate with me (ramachander926 at gmail dot com to get the corrected manthras. (Dwitheeya up to 12.58 Pm (Tritheeya afterwards ) and Asresha up to 10.56 P< that night and then Makha Nakshatra) . There is a solar eclipse 0n 26-2-2017 which is not visible in India . If in the country where you are k living Solar eclipse is visible on that day contact ramachander926 at gmail dot com for Manthras . rituals. awaiting your reply sir. Normally we do it in India on the morning of the new years day. SAme applies to you if you live outside Indaia. Tharpaanam to be done today night or tomorrow morning. My belief is that tharpanam should be done after Maadhyaanhikam. I agree that Tharpanam should be done after Madhyaanhikam, which means it should be done afternoon. But these days due to time pressure and limited number of vaidheegas it is done in the morning. In any case, Brahmyagyam is a must after Tharpanam. on both days and at what time. I am tamil iyer, yajur vedha, sirvatsa gothra. i have been trying to follow your blog recently. It depends on what Suthra you follow . If your family follows Bodhaya Sutra then you have to do Tharpanam on Bodhayana Amvasya day.Any other sutra like Apasthamba or any other on SArva Amvasya day. I think i am from Apasthamba sutra, I am not sure on it. How to find out about it. I know I am a Iyer from Yejur vedha, Srivasta gothra. Please check your abivadaye. It will come as part of it. In the case of mine it comes as "....apastamba sutra ha...Yajushaka dyayee.... then name....."
This is great sir. Thank you sir. Thank you. You are one of the few people providing this info along with shri Vish Anant at http://www.saveca.ca/ especially for those of us living in North America. Namaskarams and thanks for this information which i am following without fail regularly.Pranams. Thank you so much Sir. Really a great job. May God bless you. Thanks sir, I live in india only. will do it on new year day. But Sir on new year day on april 14th, after we do tharpanam should I fast on that day. Why is Tharpanam done on 13th april whereas Tamil New year vishu is on 14th of april? Very useful and authentic. It would be very useful if a sankrit version of tharpana sankalpam is provided - I have uncles who know Sanskrit better than English. Their is a confusion i should tharpanam today evening or tomorrow morning. In the sankalpam you have left out the portion where you have to wear the poonal in the reverse(pracheenaveethi)and mention the names of forefathers of both father and mother before you end the sankalpam. Pl add these to complete the text. I think i Have added it in THarpana Manthras given seperately .This is only for filling up the blanks in Tharpana Manthras. Thank you sir, very useful information for us. Thank you very much for your very useful service. First time I am getting Sankalpam from Internet, that too from yours. My son Muralidar S.'s birth date is 07.07.1989. He last his mother when he was just 23 days. Though his Brmhaupathesam was done about eight years back, Srardham for his mother yet to be started and only thrice I did Hiranya Srardham for his mother. Please tell me whether he has to do for the past years and how? I wish to take him to Gaya and start his Srardha karma. First time Myself is getting Sankalpam from Internet site, it is very much for your useful service. My mother died in the year 2006 and father died in the month of August 2015.The Annual Shraadh will be taken care in August 2016. Myself request you kindly guide and advise me whether myself intend to perform Pinda Daan & Asthi Bisarjan of my father and mother at Gaya and Allahabad in the month of January 2016?Waiting your early reply.With regards. As I heard from elders, A son who lost his father has to perform tarpanam all pitru days - amavasyas' atleast 4 month beginning (maasa pirappu) ( Chithirai, Aadi, aipasi and Thai) , surya, Chandra grahana days( depends on visibility in the region he lives) , Mahamaya paksham. And obviously on the annual thithi as aaptiga srardhan. Sir, I am in Riyadh. I am unable to do the pooja. Please guide me how can i perform in Riyadh by my own in my apartment. Please help me. Please tell me suitable date and time for doing Uthrayana Punyakala Tharmpanam in January 2017. I would be grateful for advise on maasa tharpanam,how to do it at home? 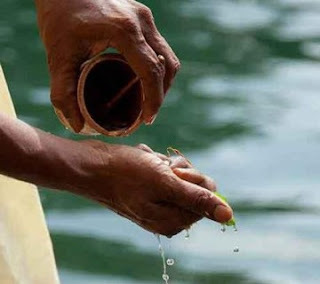 Snmkalpam is quite O.K.But how and when we should give the tharpanams? As per website" mypanchang.com" Shivrathiri is on 24th Feb,2017 in California,USA. Amavasya thithi is on 25th Feb,2017 for major portion of the day,but Amavasya thithi on 26th Feb,2017 is only upto 6.30 am.Please advicewhether Tharpanam is to be performed on 25th Feb or on 26th Feb,2017. some simple phonetic notations will help to avoid mis pronunciations when written in Roman (ENGLISH) alphabets. For example : "mAsE" instead of "mase", "asyAm" instead of "asyam" . Similarly "samvathsarE". And one correction: "thidhou" is WRONG. It is "thithou". I have posted the Tharpana Sankalpa Manthra particulars for the year 2017-18(Hevilambi Nama SAmvathsaram) in http://brahminrituals.blogspot.in/2017/03/tharpana-sankalpams-for-year-2017.html I am happy to inform you that similar information posted for the year 2016-17 was downloaded and used by more than 30000 people .May god bless you all.Please share this info with all your relatives and friends living abroad as well as in places where assistance of Vadhyars are not available. as i am working today, i didn't have time to perform the tharpanam. I follow your blog and do the tharpanaam in a near by maatha where ever i am travelling in India. Thanks a lot for guiding as a Guru in this world of Kaliyuga. Bodhayana Amavasya or Sarva Amavasya. I am smartha, yajurveda Iyer. My namaskaram and thanks in advance to you. One more concern, Tharpahanam for April tamil new year should be done in April 13th or 14th or both days and what time Pls advise. Thanks and namaskaraam to you. Hope you will be publishing Tarpana Sankalpanam for the year 2017-18 also, it's very useful information. Can you please arrange to post the tharpana sankalpams for 2017-18, hemalamba varsham. Don't panic if you have a small bill when it's time to turn in your car. Many times, you can roll that amount into the payments on the next lease cars if you buy another car and other vehicle from the same dealer. Yes, you'll pay interest on your damages, but you'll never have to deal with writing a large, lump-sum check to cover your costs. I am a regular follower of your blog. Your blog and the opinions have helped me many occasions. I wish the Almighty to give you health to continue this wonderful services for many more years. Pranams. I place my request to you to publish Amavasaya Tharpana Sankalpa mantras for the Hevilambi Nama samvatsara also (2017-2018). Thanks. Dear Sir: Thank you for the very helpful service that you are providing. Hope to get the Sankalpam mantras for 2017-18 soon. Sir, are you not updating for Hevilambi? please enlighten brief procedure for sama veda amavasya tharpanam with mantram. thank you. is it necessary to do dharpanam on every maasa pirappu day? sir please inform which the days are all should do dharpanam every month. Aadi Amavasai Tharpanam can be performed to several ancestors, but particularly this offering should be addressed to a minimum of three generations of both paternal and maternal father, grandfather and great grandfather along with their wives. It will eradicates the effects of Black magic, Curses, and Sorcery & grants tranquility and prosperity.